"Knowing they have the technical expertise, made the decision of choosing WAN Dynamics pretty simple for Saber." DynaWAN from WAN Dynamics is our custom engineered and fully managed solution powered by VeloCloud, the top SD-WAN provider, to deliver a fully integrated cloud-ready enterprise grade WAN solution. 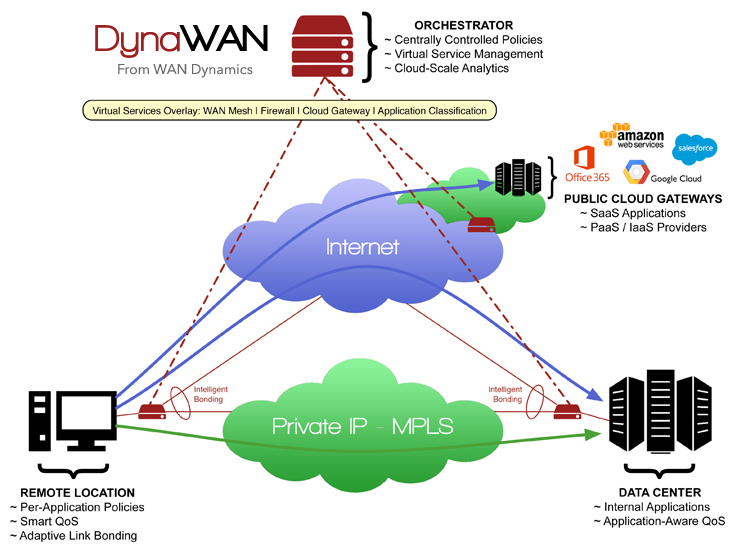 DynaWAN from WAN Dynamics is a custom engineered and fully managed solution powered by VMware NSX SD-WAN by VeloCloud, a market leading SD-WAN solution, to deliver a fully integrated cloud-ready enterprise WAN solution. Software Defined Wide Area Networking (SD-WAN) has emerged as the de facto way to interconnect branch offices. The WAN Dynamics service offering known as DynaWAN makes it possible to maintain the highest network performance levels, while reducing costs by 50% or more. Our expertly engineered solutions utilize connectivity solutions deemed best for the organization, regardless of carrier or service. We can leverage dedicated internet access over fiber/copper/wireless, broadband with cable or DSL or 4G wireless. The best means of access can be integrated to improve agility, visibility and performance, while reducing costs, deployment time and migration risks. Traditional WANs are often static, expensive, bandwidth constrained, and highly complicated to configure and troubleshoot. With over 80% of traffic on some enterprise WANs destined for the Internet, private technologies like MPLS and VPLS are often an obstacle to delivering a great user experience for today's applications. Software Defined WAN (SD-WAN) is a new cloud-first approach to delivering networks, offering the agility, flexibility, cost and performance that are required for today's applications. Based in the public cloud or on-premise, this platform allows site templates to be defined, automating the process of adding new sites or changing the characteristics of existing sites without adjusting invidivual configurations. True SD-WAN solutions are transport agnostic, with the ability to treat the underlying network transport as a commodity and build the WAN at an overlay level. This includes leveraging all available capacity of the underlying circuits, with an awareness of the quality, bandwidth and performance of each circuit to help optimize performance and select the appropriate path at a per-packet level. WAN transport can be a mixture of MPLS, Internet or Ethernet private line, with the ability to include satellite and 4G/LTE wireless services without additional complexity. Effectively leveraging multiple network paths requires a detailed understanding of the enterprise traffic. SD-WAN solutions generally perform deep packet inspection (DPI) on traffic to provide application-level classification, which allows critical traffic to be separated from low-priority traffic at a very granular level. The leading solutions utilize a centralized application signature database that classifies thousands of popular applications, enabling a smart set of defaults out of the box. SD-WAN solutions offer an entirely new level of visibility and control for operational teams. Per-application utilization reporting, quality metrics and advanced remote diagnostics provide the ability to know exactly what is happening at each location without the use of additional tools. Is SD-WAN Right For Me? We help enterprises answer this question every day. Having a detailed understanding of all SD-WAN offerings in the market and the experience to understand what is realistic in an enterprise environment, you can rely on WAN Dynamics to provide an end to end SD-WAN, from design to deployment. We can help by assessing your current environment to see if SD-WAN could be a good fit, and build a roadmap for the effective adoption of the technology.